You may have seen the new airplane safety video that's doing the rounds featuring 'The Hobbit' cast and crew. Dubbed 'An Unexpected Briefing', the promo sees Elven Air New Zealand crew members give safety instructions to hobbits, dwarves and wizard passengers visiting Middle-earth. This ain't the first New Zealand tie-in we've seen since 'The Hobbit' was announced. 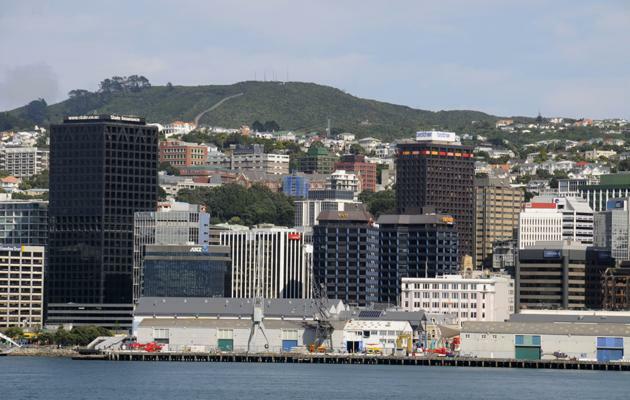 First up, they will change the name of capital city Wellington to 'The Middle of Middle-earth'. The name change will last three weeks around the 28 November premiere and see a new logo on all official documents, postcards and the local newspaper. The city's Mayor Celia Wade-Brown also decided to splash out NZ/$1.1 million (£560,000) of taxpayers' money on a 'Hobbit' party to coincide with the film's premiere. The capital will host a street parade, give free screenings of 'The Lord Of The Rings' trilogy and show the premiere on screens around Wellington/The Middle of Middle-earth. Mayor Celia Wade-Brown told Radio Australia: "I think it's really important to have not just a great event on the day, but also there is going to be more than 100 different international media outlets in Wellington that day, and we want to tell the Wellington story of talent and technology." 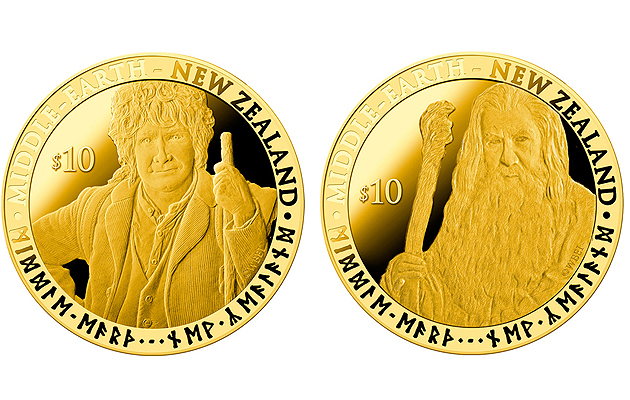 New Zealand also introduced legal tender 'Hobbit coins' (which go on sale today), some of them minted in pure gold. They feature a range of characters from the movie, such as Bilbo Baggins, Gandalf and Gollum. The coins are priced from around NZ$30 (£15.30) for the cheapest up to a rather hefty NZ$3,695 (£1,887) for said gold versions. However, the coins' value as legal tender will be far less, ranging from NZ$1 (51p) to NZ$10 (£5.10). 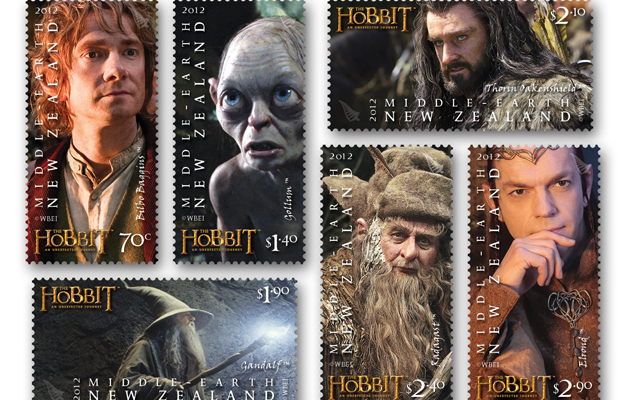 In addition, the New Zealand Post Office has also developed a range of collectable 'Hobbit' stamps. A presentation pack will retail at NZ$29.90 (£15) but will generously contain collectables to the value of NZ$37.50 (£19.13). There is also an Ultimate Collection book of collectables which will retail at $385 (£196). 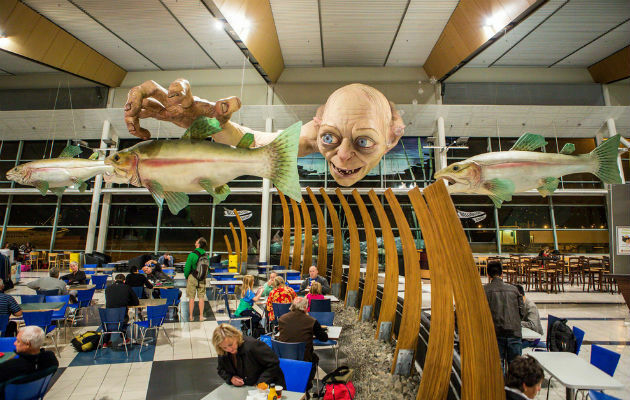 An enormous, 13 metre Gollum has taken over New Zealand's Wellington Airport to welcome weary travelers to 'The Hobbit' nation. It was made by Japanese artist Masayuki Ohashi out of fibre glass and epoxy resin, and designed by Peter Jackson's special effects stable, the Weta Workshop. Weta creative director Richard Taylor said: "Wellington airport feels like the home of Gollum after spending so many months here during the last three films." As well as the enormous Gollum, there are also three, four-metre long fish suspended from the ceiling, with bubbles emanating from the scuttling creature's mouth. 'The Hobbit: An Unexpected Journey' is released in cinemas on 14 December, with the follow-up 'The Hobbit: The Desolation of Smaug' released on 13 December 13 2013. The final film 'The Hobbit: There And Back Again' due on 18 July 18 2014.